New efforts steps up to manage the Jet Ski Industry…. Coral Harbour Base, 13 January 2016 (RBDF): The Royal Bahamas Defence Force has deployed Jet Skis in its operations around New Providence. More recently, the Jet Skis are being used to conduct beach patrols in the wake of reports concerning criminal activities occurring on beaches on or near New Providence. Last year the Defence Force introduced two Yamaha Waverunner Jet Skis to its Operation Secure Shore. Activated in December 2015, Operation Secure Shore is an expanded operation that really began in 2013. Personnel and vessels engaged in the operation are responsible for conducting continuous patrols along the coastline and waterways of New Providence. The Operation has since apprehended a number of persons engaged in criminal activities near the coast of New Providence. It has also resulted in the recovery of several stolen vessels and vehicles, in addition to bringing migrant smuggling operations on the south coast of the island to a virtual halt with the assistance of patrol craft stationed at Coral Harbour Base. As of Thursday last week, the Defence Force Jet ski patrols have expanded their area of operation to include the northern coast and the neighboring Islands of New Providence including Paradise Island. The deployment of the Jet Skis also augments patrols carried out by the Defence Force’s Harbour Patrol Unit, which has responsibility for safeguarding cruise ships and waterways near Nassau Harbour. 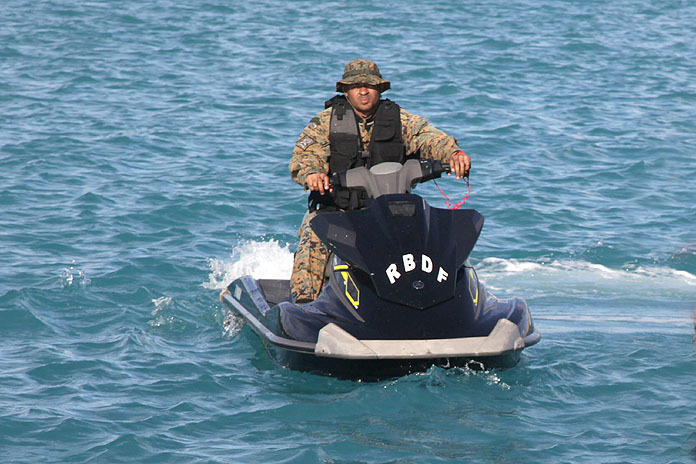 Captain Tellis Bethel, Commander Defence Force (Acting) stated that the jet skis were deployed to assist the Defence Force’s Harbour Patrol Unit in concentrating its patrols around beaches and waterways for the safety and security of visitors and locals around New Providence and neighboring islands.